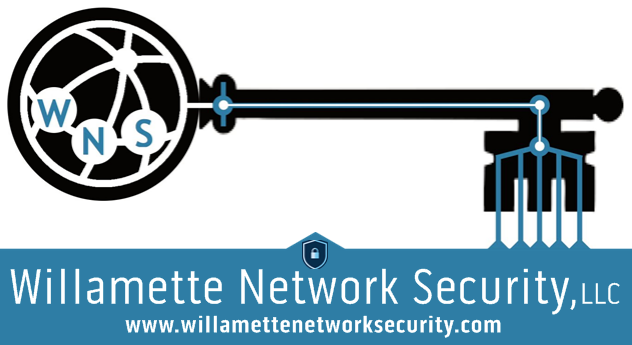 Willamette Network Security LLC – Network and cybersecurity services in Eugene, OR. Network and cybersecurity services in Eugene, OR. Call (541) 972-3080 or email info@willamettenetworksecurity.com for a free estimate. Home and business networking. Includes installing ethernet cables, wireless access points (APs), networked security cameras, VOIP phone systems, guest networks, OLCC-compliant site video monitoring (for cannabis/marijuana or alcohol locations), Smart Home appliances, and switches/routers/firewalls. Install and monitor network security equipment. From custom-built firewalls that can include built-in Intrusion Detection/Prevention Systems (IDS/IPS) to stand alone Network Security Monitoring (NSM) devices that can analyze all incoming and outgoing traffic for suspicious activity, you will find out exactly what is happening on your network at all times. This type of service is often required for HIPAA and financial data security compliance. Configure Virtual Private Networks (VPN) for remote access to home/corporate networks allowing employees to securely work from home. Network access control. Useful for both home and business users who want to limit who can be online at certain times and what network resources they may access (shared printers/servers/etc). Content/Advertisement/Pop-up filtering can be configured as part of the firewall so that you can block most adult/inappropriate material and also ads on all your connected devices (works for PCs and smartphones) without having to install adblocking software on each device. Since many popup ads also direct users to viruses and malware, this makes your internet browsing safer and much faster and is useful for both home and work environments. Specializing in, but not limited to, service of Cisco, Ubiquiti (Unifi), pfSense, Synology, NEC, Polycom, Windows, and Macintosh systems. Consumer-oriented gear is also supported. And more–if you need something unique we will find a solution for you, just ask! Our special introductory rate for new clients is $60/hour for the first contracted job. Once we have gained your confidence and have completing our first project together, our regular rate of $95/hour will apply for future work. Reduced $60/hour rate for non-profits. We know it’s hard to be a non-profit who is serving the community so we’ve decided to do what we can to help them achieve their goals with a discounted rate. Documentation of non-profit status is required for this special hourly rate. Monthly network security monitoring on a per-device basis. $10 for each networking device and $50 for each security monitoring (IDS/IPS/NSM) device. We will work with your current hardware, recommend new hardware for you to purchase, or order equipment on your behalf for best available online price +10%. All labor has a limited warranty* for 30 days from date of service. All installed hardware includes its manufacturer’s warranty for 1 year or more. Willamette Network Security is open to working with individuals or small and midsize businesses (SMBs) who need help with their IT/networking but don’t have the resources to handle the work on their own. From something as simple as setting up a home network (wired or wireless) to building a business-class Intrusion Prevention System, we want to work with you. No job is too small or too hard. *All labor has a limited warranty against defects in workmanship for 30 days from date of job completion, provided that: 1) the work performed has not been subject to accident, misuse or abuse; 2) the work performed has not been modified, altered, or had repairs made or attempted by others or inadvertently by malicious software; and 3) that Willamette Network Security LLC be immediately notified in writing within ten (10) days of first knowledge of defect by the client and have first opportunity at remedying the problem at no cost.